Beauty Professor: Mother's Day Gift Inspiration...Thoughtful Suggestions in Every Category! Mother's Day Gift Inspiration...Thoughtful Suggestions in Every Category! Above: Mother's Day gift suggestions in every category...spy something intriguing? Above: Me and my mom...I am so thankful to call her my best friend and Beauty Professor assistant...what a blessing! (1) Kate Somerville Hydrating Firming Mist...I catch myself spraying this at all times of the day; it's refreshing skincare in a spritz. (2) Venin Royale...the only skincare I've ever tried with King Cobra venom, this formula combats aging on every level. (4) Scalisi Advanced Wrinkle Cream...Hyluronic acid instantly fills lines for a stunning botox effect; my "elevens" lines were immediately lessened with a single application. (8) Clé de Peau Beauté Concentrated Brightening Eye Serum (also available at Clé de Peau Beauté)...the latest eye product from the venerable CdPB line, this serum fights undereye darkness for a positively smooth and glowing orbital area. (11) Hair La Vie...this magnificent hair formula (with 20 natural ingredients) not only stimulates hair growth; it also repairs damaged hair and feeds existing follicles for a flowing mane in months. (12) African Botanics Marula Firming Botanical Body Oil...deliciously fragrant and wildly hydrating, this stunning oil firms skin while imparting a covet-worthy glow. (13) Zelens PHA Bio-Peel Resurfacing Facial Pads...drenched with PHA, AHA and BHA acids combine forces to smooth skin, increase cell turnover and reduce the look of visible pores. My nightly indulgence as of late! (15) Sibu Omega 7...improve skin from the inside out with this antioxidant-rich supplement that harnesses the power of Sea Buckthorn to fight free-radicals and repair cells. I've incorporated two a day into my vitamin routine to give my body a boost! (17) Neutrogena Rapid Dark Circle Repair...this rich, specialized cream brightens darkness and restores glow to the eye area...brilliant. (18) ZO Skin Health OClipse Smart Tone SPF 50...a brand new formula, this broad-spectrum SPF 50 features a self-adjusting tint that fights redness and lasts for up to 12 hours. (19) Luzern Force de Vie Eye Contour Cream...with a cooling metal application wand and convenient squeeze tube packaging (perfect for the nightstand), this innovative formula works to banish puffiness and restore elasticity to eyes. (21) Eb5 Facial Treatment...affordable and effective, this all-in-one anti-aging cream targets fine lines and wrinkles while delivering tremendous hydration. Above: Eyes, face and body covered! Above: The ghd Eclipse Hair Styler...smooth, damage-free hair in seconds. For hair, I cannot recommend the ghd Eclipse Hair Styler (review HERE) enough. Every ghd styling tool is crafted with excellence and this particular model manages to create the smoothest, straightest, glossiest hair without the heat damage associated with typical straighteners. Above: IMBIBE Holy Body Cream + Fragrance Set. For those who adore a strictly natural formula, consider the Imbibe Holy Body Cream and Fragrance set. Fragranced with frankincense and myrrh, this rich cream and corresponding fragrance capture the senses and nourish the skin. Above: Fans of all natural ingredients and a warm, musky fragrance will have a major affinity for this set. (2) Guerlain Les Meteorites Pressed Powder Compact #2...the luxe glow of the Meteorites pearls with the convenience of a compact...magnifique. (8) Ben Nye Neutral Set Powder...there's a reason this loose powder is a favorite amongst professional makeup artists; just a slight dusting across the T-zone and makeup is powerfully set with a formidably invisible formula. (10) Urban Decay De-Slick Powder...entirely translucent and suitable for every complexion tone--from the fairest ivory to the deepest ebony--this mattifying powder instantly obliterates signs of oiliness! Above: From primer to powder, products to perfect the complexion! Above: Highlighters, bronzers and blushes for impeccable cheeks et al. (8) Charlotte Tilbury Beach Stick in Formentera...this sheer, buildable tan cream yields the dreamiest bronze glow...it's a makeup bag must. Above: For flush and glow...these are a marvelous bet. Above: Brows, lids and lashes...under control. (1) Le Metier de Beaute True Color Eyeshadow in Jojo...ultra silky and delightfully neutral, this pale taupe is sure to be a makeup bag staple. (3) Pixi Brow Palette...with six creamy powders in varying degrees of intensity, brows have never looked so good. (5) Le Metier de Beaute True Color Eyeshadow in Chameleon...a shimmering pale army green, this shade is undupable. Get it. (6) Tom Ford Eyeshadow (Summer '15) in Golden Peach...as good as the name implies, this double decker gem is comprised of a decadent cream formula and a glimmering powder shadow for depth, dimension and significant lasting power. Above: Eyes are, of course, the window to the soul. Above: Chic and luxurious extras. (4) Trust Fund Nail Polish in Man Crush Monday...this gorgeously unique purple boasts a smooth, shiny five free formula. (5) Diana Vreeland Smashingly Brilliant...the iconic Diana Vreeland's eponymous fragrance line is pure sophistication...notes of bright lemon, deep bergamont and warm woods collectively lend to the allure of this juice. Above: Opulent bits and baubles. Above: There's a lipstick shade for everyone. (1) Urban Decay Naked Gloss in Beso...a deep and shiny mauve for a "my lips but better" effect. (3) Lipstick Queen Frog Prince...this green bullet instantly transforms into a personalized shade of pink for a customized pout that's fairytale worthy. (8) Trish McEvoy Beauty Booster Lip and Cheek in Perfect Rose...super nourshing and blendable, this convertable shade works well on lips and cheeks for beautiful continuity and utility. Above: Lip color is the gift that keeps on giving. 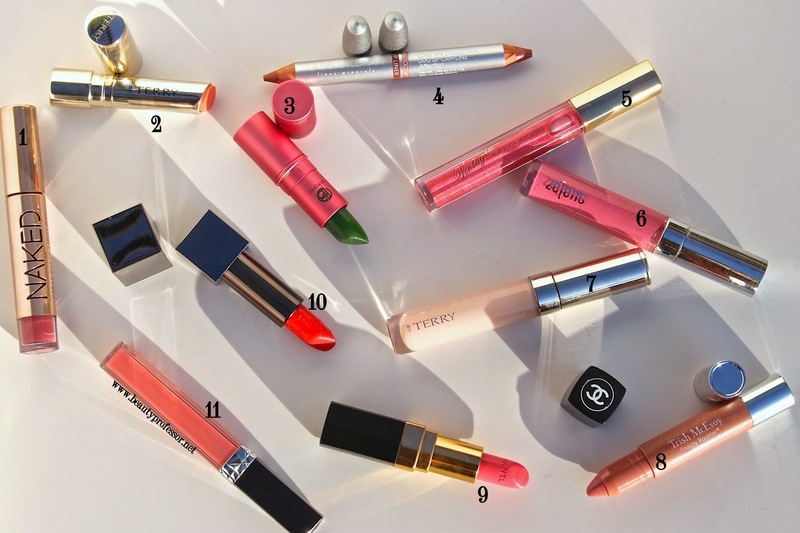 Above: Impromptu lip color swatches! Bottom Line: I hope you found this gift guide inspiring and helpful and would love to know how you plan to celebrate Mother's Day! Good things ahead, including a Gressa Minimalist Foundation review, my latest article for the Neiman Marcus Blog and a host of new product procurements! * It's great seeing the Diana Vreeland fragrance collection get some love! * I am so so so jealous of people who can give their mothers the gift of Louboutin nail polish without the brush/cap ending up in someone's eye! * If what your mother looks like is an accurate indicator, I have reason to believe you're immortal or have unicorn blood coursing through your veins - both of you look about the same age as many of the undergraduate students in my college! Isn't the Louboutin polish positively lethal looking? I adore the fact that it can double as a brilliant self-defense item! Unicorn blood = best compliment ever! Thank you. My mom does look amazing and I'm hoping her good genes extend to me ; ) Much appreciation for your sweet words, my friend!